American Law Source On-Line (ALSO) - Comprehensive compilation of links to all on-line sources of American law that are available without charge. See: U.S. Federal Government for U.S. Supreme Court decisions, U.S. Courts of Appeals decisions, U.S. District Court decisions (including Bankruptcy Court decisions), U.S. Special Court decisions, U.S. Constitution, U.S. legislation, U.S. rules of procedure and practice, U.S. administrative law sources, and more. Bankruptcy Court Directory - Maintained by Findlaw. Bankruptcy Court, SDNY - Local rules, information on electronic filing and more. Biographical Directory of Federal Judges - Includes the biographies of judges who have served since 1789 on the U.S. District Courts, the U.S. Courts of Appeals, the Supreme Court, the former U.S. Circuit Courts, and of the presidentially-appointed judges who have served on the federal judiciary's courts of special jurisdiction. Bureau of Justice Statistics (BJS) - BJS collects, analyzes, publishes, and disseminates information on crime, criminal offenders, victims of crime, and the operation of justice systems at all levels of government. Court Listener - Search engine for the Federal Courts of Appeal. The site has daily information regarding all precedential opinions issued by the 13 federal circuit courts and the Supreme Court of the United States. Court Locator - Search for federal courts throughout the U.S., or use interactive map. Courts - Directory listings for courts across the U.S.
Eastern District of New York - Local rules, judges' individual rules, directions to the courthouses, and more. Federal Courts Law Review - An electronic law review dedicated to legal scholarship relating to federal courts. Articles are from scholars, judges and distinguished practitioners. Federal District Court Opinions and Orders (Justicia) - Republishes public litigation records retrieved from the U.S. Federal District Courts. Federal Judges Biographical Database - Contains the service record and biographical information for all judges who have served on the U.S. District Courts, U.S. Circuit Courts, U.S. Courts of Appeals, and the Supreme Court since 1789. Federal Judicial Newsletter: The Third Branch - Published monthly by the Administrative Office of the U.S. Courts. Federal Judicial Center (FJC) - The research and education agency of the federal judicial system. Federal Judiciary Court Links (U.S. Courts) - A complete and directory of official U.S. Federal District Court and Circuit Court websites. Federal Judiciary Home Page, The - Maintained by the Administrative Office of the U.S. Courts on behalf of the U.S. courts. News and information about the federal courts. Federal Justice Statistics Resource Center - Maintains the Bureau of Justice Statistics (BJS) Federal Justice Statistics Program (FJSP) database, which contains information about suspects and defendants processed in the Federal criminal justice system. Using data obtained from Federal agencies, the FJSP compiles comprehensive information describing defendants from each stage of Federal criminal case processing. Federal Legal Information Through Electronics (FLITE) - Historic file of U.S. Supreme Court decisions released by the U.S. Air Force. The file consists of over 7,000 Supreme Court opinions dating from 1937 through 1975, from volumes 300 through 422 of U.S. Reports. Federal Court Locator - To find a court location, click a state in the map below or use advanced search. Federal Court Rules and Policies - The U.S. federal judiciary's web site on the federal rules of practice, procedure, and evidence. Provides access to national and local rules currently in effect in the federal courts, as well as background information on the federal rules and the rulemaking process. FedLaw - Research tool for Federal lawyers and other Federal employees. FindLaw: Cases and Codes - U.S. federal codes, statutes and regulations, reported opinions from U.S. Supreme Court, circuit courts, trial courts, and other federal courts. FindLaw: U.S. Supreme Court Decisions - FindLaw's searchable database of the Supreme Court decisions since 1893 (U.S. Supreme Court Decisions: U.S. Reports 150-, 1893-). Browsable by year and US Reports volume number and searchable by citation, case title and full text. Fix the Court - A national, non-partisan grassroots organization created to take the Supreme Court to task for its lack of accountability and transparency and to push its Chief Justice and associate justices to enact basic yet critical reforms to make the court more open and honest. Guide to Law Online - The Guide to Law Online, prepared by the U.S. Law Library of Congress, is an annotated guide to sources of information on government and law available online. It includes selected links to useful and reliable sites for legal information. Emphasis has been on sites offering the full texts of laws, regulations, and court decisions, along with commentary from lawyers writing primarily for other lawyers. Materials related to law and government that were written by or for lay persons also have been included, as have government sites providing general information. 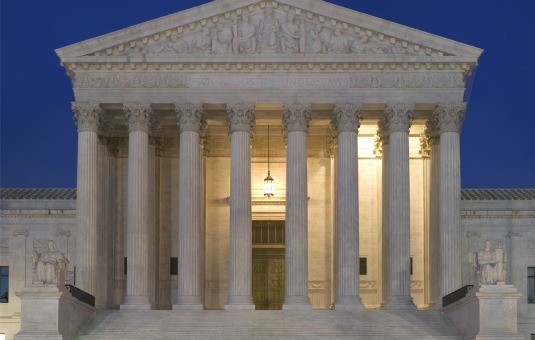 Guide to U.S. Supreme Court - Prepared by JURIST: The Legal Education Network. Historic Supreme Court Decisions - by Party Name - The cases included in the LII Historic Collection are listed alphabetically. Following each case name there are two additional links: "(recent Fed?)" and "(recent Supct?). These links launch searches of the LII's index of recent U.S. Court of Appeals decisions and its index of recent Supreme Court opinions seeking references to the historic decision in question. History of the Federal Judiciary - This on-line reference source contains a biographical database of federal judges since 1789, histories of the federal courts, and historical documents related to the judicial branch of government. Interviews of United States Supreme Court Justices - In 2006-2007, Bryan Garner interviewed eight of the nine Justices about legal writing and advocacy. These are the complete video interviews. Garner is editor in chief of Black's Law Dictionary and the author of many leading works on legal style, including A Dictionary of Modern Legal Usage, The Elements of Legal Style, The Redbook: A Manual on Legal Style, The Winning Brief, and Securities Disclosure in Plain English. Judicial Business of the United States Courts - Annual reports from the director of the Federal judiciary. Judicial Facts and Figures - A set of tables containing historical caseload data primarily for the fiscal years from 1988 to 2002. This publication includes data on the U.S. Courts of Appeals, the U.S. District Courts, and the U.S. Bankruptcy Courts. The sources for the data were the Annual Report of the Director, the Judicial Business of the United States Courts, Federal Court Management Statistics and a few unpublished statistical tables. Judicial Selection Project - A project of the Alliance for Justice. Monitors and investigates judicial nominations at all levels of the federal branch, and encourages public participation in the confirmation process. Justice Integrity Project - Promotes effective oversight of federal prosecution and judicial misconduct. Landmark Supreme Court Cases - This site is developed through the collaboration of teachers, attorneys, law students, Street Law, and the Supreme Court Historical Society. Supreme Court Insider - News, cases accepted for review, latest decisions, oral arguments, commentary, and more. Legal Language Explorer - Emory and Michigan State Law Schools have teamed up to create a free database that allows you to search for a term or phrase in U.S. Supreme Court opinions (1791-2005) and automatically generate a time-series frequency chart of the phrase's appearance along with cases in which the phrase occurs. liibulletin - Free e-mail service from Cornell Law School distributing the syllabi of U.S. Supreme Court decisions in bulletin format within hours after their release. LLRX Court Rules, Forms and Dockets - This site includes links to over 1,400 sources for state and federal court rules, forms and dockets. It is mainatined by Margaret Berkland. National Institute of Justice - The research agency of the U.S. Department of Justice. New York Times Supreme Court Search - Browse, search supreme court decisions, orders, briefs, court rules and court schedule. Office of Administrative Law Judges (OALJ) - The trial court for most of the U.S. Department of Labor's formal adjudications, such as black lung and longshore workers' compensation programs, nuclear and environmental whistleblower cases, OFCCP enforcement actions, Workforce Investment Act disputes, permanent and temporary alien labor certications, and a wide variety of other case types. Oyez - A multimedia archive devoted to the Supreme Court of the United States and its work. It aims to be a complete and authoritative source for all audio recorded in the Court since the installation of a recording system in October 1955. PACER Service Center - The Federal Judiciary's centralized registration, billing, and technical support center for electronic access to U.S. District, Bankruptcy, and Appellate court records. See PACER Web Links for links to courts that provide case information on the Internet supported by the PACER Service Center. PACER Service Center: Case Management/Electronic Case Files (CM/ECF) - CM/ECF is a case management system being implemented in the Federal Judiciary for all bankruptcy, district and appellate courts. CM/ECF allows courts to accept filings and provide access to filed documents over the Internet. Preview - An eight-issue subscription publication that provides, in advance of oral argument, expert, plain-language analysis of all cases given plenary review by the U.S. Supreme Court. Preview issues 1-7 precede the Court's seven argument sessions from October to April. Published in July following the close of the Court's term at the end of June, Preview issue 8 reviews the term using a combination of charts, statistics, case summaries, and essays. Pronouncing Dictionary of the Supreme Court of the United States - Drawing on textbooks, recordings, accounts by litigants or counsel, pronunciation guides, journalism, and surveys, the Yale Law Shool has identified Supreme Court cases most susceptible to mispronunciation and provided here proper pronunciation. Search U.S. Circuit Courts of Appeals - Search decisions from either one or all of the U.S. Circuit Courts of Appeals. State Supreme Court Database (The S. Sidney Ulmer Project) - Constructing a data base containing information on State Supreme Court decisions in all fifty states. Statistical Reports of the Federal Judiciary - Annual reports and caseload statistics of the U.S. Federal Judiciary. Supreme Court Collection - The Legal Information Institute (LII) offers Supreme Court opinions under the auspices of Project Hermes, the court's electronic-dissemination project. This archive contains nearly all opinions of the court issued since May of 1990. Supreme Court Database - Contains over two hundred pieces of information about each case decided by the Court between the 1953 and 2008 terms. Examples include the identity of the court whose decision the Supreme Court reviewed, the parties to the suit, the legal provisions considered in the case, and the votes of the Justices. Supreme Court Historical Society - Dedicated to the preservation and dissemination of the history of the Supreme Court of the United States. Supreme Court Nominations and Documents - Supreme Court nominations materials. Supreme Court of the U.S. - Official site: Docket Information, Information About Opinions, Oral Arguments, Court Rules, Opinions, United States Reports Bound Volumes. Supreme Court Nominations Materials - From the Law Library of Congress. Supreme Court Nominations Research Guide - This guide from the Georgetown University Law Center is designed to explain the nomination process of judges to the U.S. Supreme Court and to suggest resources for further research in the nomination process. Supreme Court Rules - Rules of the U.S. Supreme Court, adopted July 17, 2007, effective October 1, 2007. Supreme Court Watch - PBS Online NewsHour coverage of the U.S. Supreme Court. Telephone Access to Automated Case Information Services in the U.S. Courts - PACER directory to various automated case information services in federal court system. Third Branch, The - Newsletter of the U.S. Federal Courts. Published monthly by the Administrative Office of the U.S. Courts. Trac Reports: Judge Info Center - Caseload information on each federal district judge who sentenced at least 50 individuals since FY 2007. U.S. Attorney for the District of Columbia - This is the largest United States Attorney's Office with over 350 Assistant United States Attorneys and over 350 support personnel. It is responsible not only for the prosecution of all federal crimes, but also for the prosecution of all serious local crime committed by adults in the District of Columbia. In addition, it represents the United States and its departments and agencies in civil proceedings filed in federal court in the District of Columbia. U.S. Bankruptcy Courts - Federal courts have exclusive jurisdiction over bankruptcy cases. Bankruptcy cases cannot be filed in state court. Each of the 94 federal judicial districts handles bankruptcy matters. The primary purposes of the law of bankruptcy are: (1) to give an honest debtor a "fresh start" in life by relieving the debtor of most debts, and (2) to repay creditors in an orderly manner to the extent that the debtor has property available for payment. U.S. Circuit Courts - U.S. Circuit Court directory. U.S. Court Forms - Free court forms for all states. U.S. Court of Appeals - 9th Circuit - Now with official YouTube video and audio. U.S. Court of Appeals for the Armed Forces - Exercises worldwide appellate jurisdiction over members of the armed forces on active duty and other persons subject to the Uniform Code of Military Justice. The Court is composed of five civilian judges appointed for 15-year terms by the President with the advice and consent of the Senate. U.S. Court of Appeals for the Federal Circuit - The 94 U.S. judicial districts are organized into 12 regional circuits, each of which has a United States court of appeals. A court of appeals hears appeals from the district courts located within its circuit, as well as appeals from decisions of federal administrative agencies. In addition, the Court of Appeals for the Federal Circuit has nationwide jurisdiction to hear appeals in specialized cases, such as those involving patent laws and cases decided by the Court of International Trade and the Court of Federal Claims. U.S. Court of Appeals for Veterans Claims - The Court can review final decisions of the Board of Veterans' Appeals (BVA). Only the claimant may seek such review. Most cases deal with entitlement to disability or survivor benefits, or the amount of those benefits, but a few deal with education benefits, life insurance, home loan foreclosure, or waiver of indebtedness. U.S. Court of Federal Claims - The Court of Federal Claims is authorized to hear primarily money claims founded upon the Constitution, federal statutes, executive regulations, or contracts, express or implied-in-fact, with the United States. Case Management/Electronic Case Files (CM/ECF) - Provides courts enhanced and updated docket management. It allows courts to maintain case documents in electronic form. And it gives each court the option of permitting case documents - pleadings, motions, petitions - to be filed with the court over the Internet. U.S. Courts (Federal Judiciary Court Links) - A complete directory of official U.S. Federal District Court and Circuit Court websites. U.S. Courts for the Ninth Circuit - Official home page: documents, careers, court links, opinions. U.S. Department of Labor: Office of Administrative Law Judges - The trial court for most of the Department's formal adjudications, such as black lung and longshore workers' compensation programs, nuclear and environmental whistleblower cases, OFCCP enforcement actions, Workforce Investment Act disputes, permanent and temporary alien labor certications, and a wide variety of other case types. U.S. District Court for the Central District of California - Calendar, filing procedures, forms, general information, local rules, notices from the clerk, recent opinions, services, and more. U.S. District Court for the Northern District of California - Attorney admissions, CJA and pro bono information. Register for PACER at this and other Federal Courts nationally (to access dockets electronically via the web). Information, including links to the Judge's clerk, calendars, standing orders, recent orders, special requirements for individual judges. Local rules, general orders, procedual guidelines. Also, some opinions are placed on this website. U.S. District Court for the Northern District of California E-Filing - The USDC Northern District of California electronic filing system streamlines the process of creating, filing and noticing legal documents by permitting attorneys in selected civil cases to file documents with the Court and deliver them to opposing parties directly from their computers using the Internet. U.S. Federal Court Opinions - Maintained by Georgetown University Law School. U.S. Party/Case Index - Part of the PACER Service Center. A login and password, issued by the PACER Service Center, is required. U.S. Sentencing Commission - The Commission's duties include developing guidelines for sentencing in federal courts; collecting data about crime and sentencing; and serving as a resource to Congress, the Executive Branch, and the Judiciary on crime and sentencing policy. Briefs - Briefs filed the Solicitor General. U.S. Supreme Court Briefs via ABA - Briefs from current term. U.S. Supreme Court Briefs via FindLaw - Before presenting their oral arguments, counsel for both sides will submit a legal brief summarizing the facts of the case as well as the legal reasoning behind their arguments. This site archives briefs from the 1999-2000 term to the present. U.S. Supreme Court Center - U.S. Supreme Court cases and opinions. Searchable. U.S. Supreme Court Collection - Current and historical decisions. Maintained by the Cornell Law School Legal Information Institute. U.S. Supreme Court Database - Resource for researchers, students, journalists, and citizens interested in the U.S. Supreme Court. The Database contains over two hundred pieces of information about each case decided by the Court between the 1791 and 2015 terms. Examples include the identity of the court whose decision the Supreme Court reviewed, the parties to the suit, the legal provisions considered in the case, and the votes of the Justices. U.S. Supreme Court Decisions - FindLaw's searchable database of Supreme Court decisions since 1893 browsable by year and U.S. Reports volume number. Searchable by citation, case title and full text. U.S. Supreme Court Fellows Program - Since 1973, the Supreme Court Fellows Program has enabled exceptionally talented people to contribute to the work of the Supreme Court of the United States, the Federal Judicial Center, the Administrative Office of the United States Courts, and more recently the United States Sentencing Commission. Founded by Chief Justice Warren Burger, the program provides fellows an opportunity to study firsthand both the administrative machinery of the federal judiciary and the dynamics of interbranch relations. U.S. Supreme Court Historic Decisions by Justice - This page lists all justices who have served on the Supreme Court. The justices whose names are linked are represented by one or more opinions in this historic collection. Clicking on a linked name will retrieve all the opinions by that justice included in the collection (including concurring and dissenting opinions). Following each justice's name is a link to a brief biography. The source for most of these notes is a publication of the Commission on the Bicentennial of the United States Constitution, entitled The Supreme Court of the United States: Its Beginnings and Its Justices 1790-1991. Maintained by Cornell Law School's Legal Information Institute (LII). U.S. Supreme Court Monitor - Supreme Court news, commentary, decisions, and cert. granted. Maintained by America Lawyer Media. U.S. Supreme Court Opinions - Supreme Court opinions under the auspices of Project Hermes, the court's electronic-dissemination project. This archive contains nearly all opinions of the court issued since May of 1990. U.S. Supreme Court Oral Arguments: A Research Guide - Cornell Law Library. U.S. Supreme Court Records and Briefs : A Research Guide - Cornell Law Library. U.S. Supreme Court Rules - Provided by Cornell Law School. Browse a table of contents or perform a full text search of the rules. U.S. Tax Court - A judicial forum in which affected persons could dispute tax deficiencies determined by the Commissioner of Internal Revenue prior to payment of the disputed amounts. The jurisdiction of the Tax Court includes the authority to hear tax disputes concerning notices of deficiency, notices of transferee liability, certain types of declaratory judgment, readjustment and adjustment of partnership items, review of the failure to abate interest, administrative costs, worker classification, innocent spouse relief, and review of certain collection actions. This webpage last updated on Sunday, November 12, 2017 12:13 PM.